I loooooove to entertain. Feeding people is what makes me happy. But when the weather’s like it was Saturday and I get ahold of something good like that sangria, sometimes I just want to be outside and not have to fuss too much over whatever we’re eating. I had a feeling this was going to be the case Saturday so when I was thinking of something to cook, I decided to just throw a bunch of good stuff in a pan and hope for the best! I’m thinking of classifying this as a no-fail recipe because the truth is, by the time this thing was half done, I was feeling that sangria and it still came out perfectly! I doubled this recipe and four adults, one teenager and four onions ate every single last flippin bit of this. GONE. Toss chicken legs with 3 tablespoons olive oil in a large bowl. Add 2 tablespoons of Chicken Scratch to chicken and toss chicken with hands until seasoning is evenly distributed. Spray an 18x13 baking pan (or two standard-size cookie sheets) with cooking spray then arrange chicken on pan. Bake, uncovered, at 300 degrees for one hour. Wash potatoes and cut into cubes (leave the skin on) then add to a large bowl. Cut onion and bell pepper into chunks and add to potatoes. Add 3 tablespoons olive oil and remaining 3 tablespoons of Chicken Scratch to vegetables and toss to coat. Set aside. Remove chicken from oven and pour off any liquid from the pan (reserve for Greasy Rice if desired). Add vegetables to pan around the chicken pieces. Return pan to oven and continue baking, uncovered, at 300 degrees for one more hour. *I know a lot of you are going to ask about using white meat or boneless/skinless pieces but I don't recommend it as it will dry out. If you insist, cut the cooking time in half and cook it all together for 1 hour at 300 degrees. What? You can't eat 20 chicken legs??? LOL... hope you liked it! LOL!! Oooh...this was good!! And so easy! Making it again this weekend! I provide a printable copy for your use and there are many other ways you could save this recipe. You could certainly bookmark the recipe into your internet browser or, like many of my readers, "Pin" the recipe to Pinterest so you'll have a visual recipe box for the future. Hi, just found your site, love your recipes. This one is similar to my version of a Ho-Bo meal. Put same chicken or beef in aluminum foil and add vegies. Wrap up so easy to open when done. Put in oven about 350 degrees and for one hour, depending how much you have cooking. This is good for singles or couples to make individual ones and the clean up is great! Why can't I use plain potatoes? Yukon Gold potatoes are so expensive at our grocery store. I'm pretty sure the potato police won't haul you away if you don't :o) Use whichever potatoes you like. I just made this and it is soooo good and so easy. My whole family cleaned their plates, and that doesn't happen around here too often. Thanks for sharing. Yay! Music to my ears! Thanks for letting me know! We've entered a deep plunge here in the Midwest today. I cooked 2 meals yesterday. My hubby made breakfast and I cleaned. I washed the same cast iron skillet 3 times!!!! I said ALL that to say this....a one pan dinner sounds really good for a cold lazy day like today!!!! I've made it before do I KNOW it's yummy! Love your site. 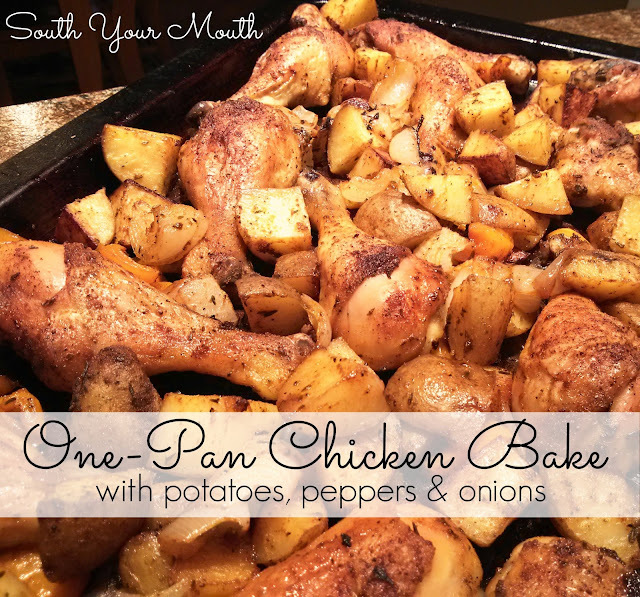 I have made this recipe a couple of times and my family loves it! Its so easy to make, perfect for those busy school nights. Thanks for posting!